A truly modern machine, in 1952 - the Elna Supermatic! I didn't really go in search for a Supermatic, someone in a forum I read was selling one for a good price, and I had been reading about it so I decided to go for it. She didn't know if it was working, it turned by hand but like many machines the power cord had been lost, so I got a bargain. We met up on the streets of Portland where the seller was working. I had to get it home and order a cord before I got to play, but I was very impressed with this machine. It didn't come with all of the accessories, I had fun collecting them. But with just an oiling this machine ran great. It isn't as quiet as the Grasshopper, but mine didn't seem to have the growl that Supermatics can develop after sitting. There in an interior friction wheel, called a pulley, that can develop a flat spot and make the machine run noisily. There is a youtube video that has the sound if you are wondering if you have this issue. In some ways, this machine does pretty much anything you might need for sewing, it really can be competition for a modern machine. It has a free arm, and a series of stitches can be made by changing cams, called "discs". Here is a bit of info showing available stitch patterns. And this came on the market in 1952! I know someone who does production sewing for farmers markets using a Supermatic, in addition to the stitches you can use low shank attachments. Bobbins and needles are readily available. It just needs regular oiling, unlike a modern plastic machine that needs no maintenance, and also is pretty much disposable. http://ismacs.net/elna/remember_the_elna.html . And this chart helps with dating your Supermatic. For Elna parts, including the pulley and info on replacing it, I recommend White Sewing Center. There is also a vintage Elna group on Yahoo that is full of information. And of course often these vintage machines have lost their manuals, here is a link to a scanned version. I know this post has lots of links, and not a lot of personal info. There is a lot out there about Supermatics, I don't feel like I have much to add. And you may notice that I have been using past tense, I found a new home for my Supermatic, after cleaning it up and playing with it a bit. No particular reason, I just wasn't using it and there is always another sewing machine to add to the collection. In fact I had already bought a couple more by then, and space was growing tight. If you have seen my profile elsewhere, I live on the Oregon Coast, with my office on Highway 101. The buyer lived down the coast from me, and sent her husband to pick up the supermatic. So I had the privilege of seeing it leave strapped to the back of a motorcycle, to find it's way to a new home. Wish I had gotten a picture of that! Oh, and a final thought - sometimes you see folks describe the green Supermatic as a Grasshopper, nope that is the Elna #1, shown in last week's post. Yes they are both green, and both have the folding knee lever - but they aren't the same thing. I think part of the reason it happens, at least on eBay, is the fact that eBay suggests title improvements that will help your item sell -- and it keeps trying to add #1 to my listings for vintage Elna items. I guess they are more collectible, but it doesn't always apply! Truly portable Elna #1 - the Grasshopper. I kept reading and looking at smaller, hopefully more lightweight machines. I soon fell in love with the Elna Grasshopper, and hunted one down. Nicknamed the Grasshopper for the folding knee control lever, it is truly portable with an accessory case that sits behind the free arm and fits inside the sheet metal case. The case is truly ugly, mine is really thrashed. It used to have a leather handle, but all that is left is a rusted metal strap. The color looks like an ammo case. But it folds out into a neat table. My case is especially beat up on the outside, with a rusty handle. I am really considering spray-painting it a fun color on the outside. Have to figure out what goes with the green. So not hard to find, but the one I got doesn't fit that well so it is kind of annoying but it does work. 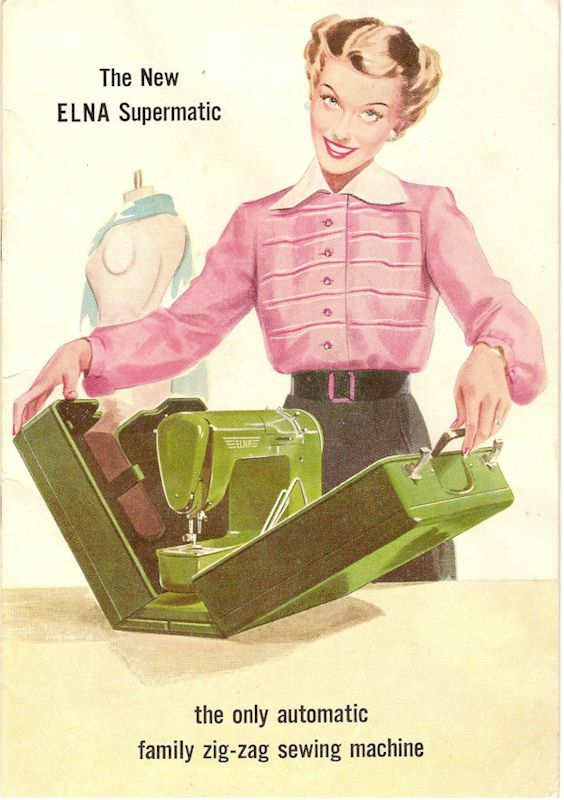 I should have ordered from White Sewing Center http://whitesewingcenter.com/elnaparts.php this is the authoritative source for vintage Elna parts. I later ordered a light bulb and a replacement belt from him, and they are nice quality. The big thing I was missing was a manual, I would love a paper copy, but was able to find a free pdf version online. You can find one in the Yahoo Elna Group files (after you join) or here is another version. One of the things you will read about in the manual is oiling, and using kerosene in the bobbin race. Originally it came with two cans, one for oil and one for kerosene. So far I have only oiled it, and it is super quiet. One of these days I will get a bit of kerosene and try it as someone mentioned it made it even smoother. It does seem to to need oil each time I use it, but I don't get it out that often. But when oiled, it is so quiet. One of my favorite things to do with this machine is to bring it out into the family room and do quilt piecing. It sews a beautiful stitch on two layers, I did have a bit of trouble with a thicker project involving several layers and batting, but I think if I had changed feet and adjusted the tension it would have been fine. I don't think this is the machine to stitch jeans on, but I haven't tried it. The manual lists standard attachments: Presser foot (on the machine), mobile foot (not in picture, its gunky and soaking in tri-flow). Darning foot and darning plate, and 4 mm Hemming Foot. I also got an attachment box with the screwdrivers, some bobbins, needles and the green oil can. The black thing is a speed reducer, I haven't tried it yet but it slows the machine speed for darning and other special techniques. This blog https://elnagrasshopper.wordpress.com/tag/elna-1-speed-reducer/ tells all about it. My Grasshopper serial number is 8210209, and it was made in 1948. Pretty nifty little machine. I loved the look of it before I got one, but I bonded with it when I first sewed, it is so quiet and makes such a pretty stitch. Next week I will talk about the Grasshopper's big sister, the Supermatic. Designed to compete with Featherweight? Not really...White 77MG. As I continued to read up on 3/4 sized portable machines, I ran into this info in a book about Featherweights. Since I already loved my White Family Rotary, I was excited to read about a magnesium version of a White machine that was made to be portable. I was soon on the hunt for a White 77MG. I scored one pretty easily at an auction site, they aren't super rare. It's a straight stitch machine, in a dark green crinkle finish. I love the deco styling of the badge and dials.. It takes regular 15 x 1 needles, the bobbins aren't at your fabric store, but are easy to get online as they fit many machines. Here is a link http://shop.sew-classic.com/Bobbins-White-Kenmore-Rotary-5-pack-744.htm and sometimes you can find them on eBay. Another complaint is that it is a friction driven machine. Rather than a belt driving it, there is a rubber wheel which rests against the hand wheel and powers the machine. Sometimes after it sits against the wheel awhile, it develops a flat spot. This can be prevented by keeping it away from the wheel while not in use, a pencil or chopstick works great for this. If it does develop a flat spot, since it it an external part it isn't hard to fix, or replace. I have read about shaving it down until smooth, but since I can find a rubber pulley online at somewhere like Sew Classic for under $5 I would probably take that route. But even if you aren't so lucky, these are easy to find on eBay and other sites. There are different size of openings on the top clamping rotary attachments, this machine uses the ones with the 3/16" wide opening on the top. So not a replacement for a featherweight. It does come in a similar case, but in the case the whole thing weighs about 30 lbs. But a sturdy straight stitcher, with some cool retro looks. I haven't made a project on this one yet, wonder what it wants to make? The search for Portability, two Singers 99K and 185J. Another title for this post could be "portable is relative". These two Singers are 3/4 sized machines, and while they are smaller and lighter than their full sized cousins, they are not lightweight. While I love my treadle, and machines in cabinets for really diving into projects, sometimes I want to sew in a different location. So I started hunting for a machine that I could move into the dining room, or take somewhere else and bring along a project. I started reading about the 99 and 99K machines. The K indicates it was made in the UK, in Scotland. This is the 3/4 size of the Singer 66. It takes the same low shank attachments, drop in type 66 bobbin and standard 15 x 1 bobbin. There is so much information on these relatively common machines, that I won't repeat it here. A google search will give you tons of info, and manuals are readily available too. I bought the lovely wood base from someone online. Unfortunately this was a lesson in buyer beware as far as shipping, the machine was sent in a box with some bubble wrap and no heavier padding. When it arrived one of the cast iron "feet" was broken off. This didn't affect the use of the machine, since you can't sew with this machine without a base. But it was a big disappointment. The seller was a general collectibles dealer, and probably thought that cast iron was impossible to break. In reality it can be brittle, and this box was obviously dropped and that foot poked through the plastic wrap and took a hit. So look for sellers online that have experience shipping sewing machines. They can be shipped without damage with proper packing, just ask questions. You also have to have a spoked wheel, which you can buy from the sellers who sell the hand cranks. I put the original wheel back on and plan to buy a motor for this one. So, portability? It weighs about 22lbs, so I can lift it but it isn't light. I don't have a case. But I can tote it out to the dining room table. And it makes a lovely stitch, just like the 66. A real gem of a machine. They were made from 1911 until 1958, not hard to find and easy to find parts for. Mine was made in 1951. Grab one if it comes by at a reasonable price. In the 1950s sewing machines were pouring out of Japan, many in bright colors, and I believe this is why Singer tried to compete by adding some colored machines. My next 3/4 sized machine was a 185J, made in 1958. It's another straight stitch machine, which takes all the same parts as the 99k and many others. They were made from the late 50s to early 60s, so there aren't as many around but they aren't rare either. Great for piecing quilts, and other straightforward sewing, and there are lots of attachments if you want to branch out. So I had two 3/4 sized Singers, lovely machines, but not really portable. Next week another "portable" machine.